Now in your shopping cart! On April 30th, Europe acquired a new King and Queen, a fact that could not possibly have escaped many. That it also, on that same day, actually lost a Queen perhaps comes as more of a surprise. 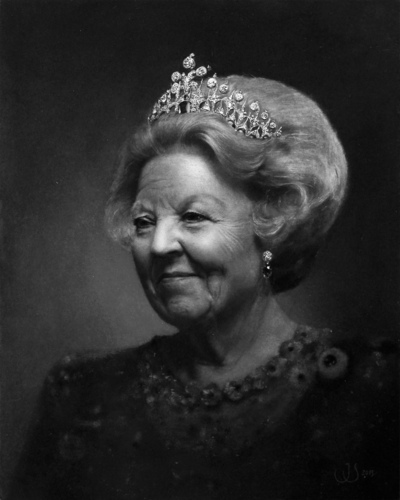 In accordance with a tradition created in 1948 by her grandmother, and carried on in 1980 by her mother, Queen Beatrix abdicated not only the throne but also the title of Queen, choosing from now on to be known simply as Princess Beatrix. Is there, in the history of Monarchy, any other precedent for this rather unusual policy? The concept "Ex-King" comes to mind, but that usually refers to monarchs who have been dethroned, perhaps through a revolution or a referendum. One of the more notorious abdicators, The Duke of Windsor, was rarely referred to as Ex-King, although technically he was. "Queen Dowager" is another expression, referring to a Consort Queen after her husband, the King, has died. Have there been any Prince Consort Dowagers around? Well, sort of; When Queen Maria da Gloria of Portugal died in 1853, she was succeeded by her eldest son, King Pedro V. Her husband, Ferdinand of Saxe-Coburg, did survive her by more than 32 years, but in 1837 he had already received the title of King, although it was his wife who reigned the country. In fact, since Pedro V was under age when his mother died, it was his father, the titular King Ferdinand, who stepped in as regent for his son for a couple of years. In the clerical world, there is another expression for retired people; Emeritus. In our country one might refer to a Vicar Emeritus or a Bishop Emeritus. The concept "Professor Emeritus" can also sometimes be heard. It is a rather kind word, with a positive ring to it. The "merit" part of the word indicates, that it describes someone who has done good and deserves his rest. But what if it is a woman? Easy, the correct word is Emerita! And if there are two or more of them? Try Emeriti. I love these old Latin endings and hope for a revival of them. I always insist on using the i-plural whenever possible (and sometimes, obnoxiously, when it is not). Thus you can hear me talk of the cacti in my window-bay, the croci in my flowerbeds and the fierce hippopotami on the African savannas. So, have a happy retirement, Beatrix, Queen Emerita. Webbplatsen är producerad av Bravomedia.